Now, 14 years later, Art Basel Miami Beach has cemented itself as one of the premiere fairs for modern and contemporary art in the world. What began as Basel has led to several days of art fairs across the region -- from the beach to Broward and back. It certainly didn’t create the artistic community in South Florida, but it has provided an international spotlight for visual art, a growing audience of patrons and artists and -- perhaps most importantly -- business. The fair opens with its invitation-only viewing on Wednesday. It opens for the public beginning on Thursday. 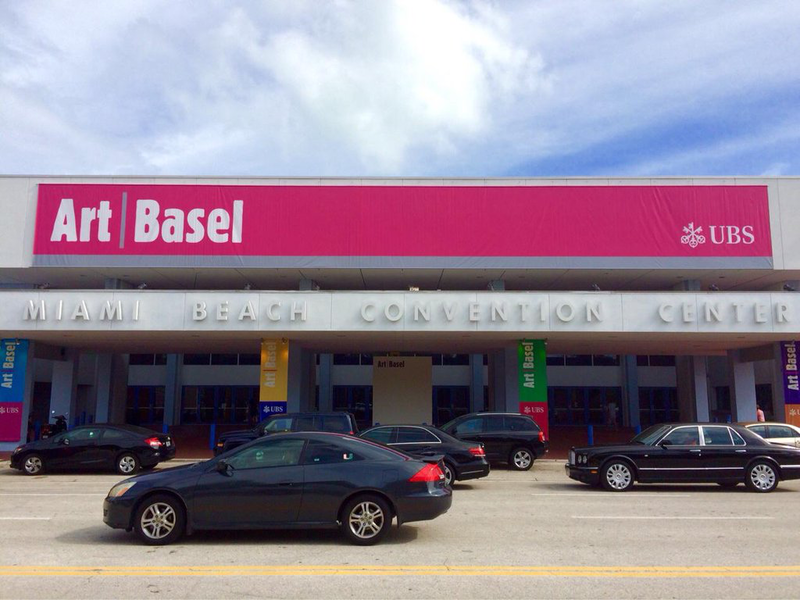 We spoke with Art Basel Global Director Marc Spiegler and Americas Director Noah Horowitz about how Miami Beach fits into its portfolio of art fairs, art and the global economy and the coming renovations to its home on the beach -- the Miami Beach Convention Center. Spiegler: We had virtually 100 percent of the galleries that were there last year applying and battling it out with a great group of new contenders coming into the show. We came to a community where there was a lot of momentum. Horowitz: Art Basel arrived in Miami in 2002 and really opened a gateway for an august art fair to the American and Latin American markets in a way that hadn't been done before. I was in Bogota in early October. I saw huge support of collectors and curators in the artistic community from across this area. They see Miami as this focal point to meet everybody and come together. That’s unique within the art fair infrastructure and has led to the growth and strength. Horowitz: The success story behind Miami Beach is one of the revised structure of how our market functions. It used to be principally based between New York and London or Paris. Miami Beach has opened a gateway to a different consideration of how that comes together and how people buy and sell things. Miami as a community has an incredibly important group of collectors and institutions that were there from the beginning. That gave breadth to what we're able to achieve today. Spiegler: A lot of people like to give our show credit for this, but I think the reality is that we came to a community where there was a lot of momentum in terms of the private collectors who were here. I think the fact that once per year the whole international art world comes to Miami Beach and the South Florida area has really sparked a lot of interest. I wouldn't say that we could take credit. I certainly think we've been part of a really exciting cultural dynamic. Horowitz: One of the exciting things for 2015 is re-strengthening of the museum and cultural community in Miami Beach. Several institutions are either opening or are undergoing construction for new space. There’s a very bright future and it's all coming together as the fair itself has grown over the last decade. After Art Basel 2015 closes, construction begins on the Miami Beach Convention Center for a three-year, $500 million renovation. The center will continue to host Art Basel during the work. Spiegler: For this year it has no impact. The construction doesn't start until the day after we close. For next year it has no impact on the floor plan itself. One of our concerns was that we would have to do a new floor plan for 2016 and then a new floor plan for 2017. We're able to maintain the same floor even though the construction is going on. In 2017 we have a completely new convention center with new entryways, a floor-to-ceiling two-story glass lobby, a glass-walled lobby and a park across the street where there's now a parking lot. It’s going to be a whole new world. We will have terraces where people can do events. We will have parking directly in the building. We're really looking forward to being in a state-of-the-art convention center. Wi-Fi has been the biggest issue for us. Spiegler: Our focus with the shows is very much on the cities where they take place. We deal very closely with the museums and the collectors and with the various aspects of the city. When you come to the Miami Beach show, you should know that you're in Miami Beach. It shouldn’t feel like a copy-and-paste version of the show in Basel of the show in Hong Kong. When you're in the hall we obviously try to build to the highest level of quality and hold everyone to the same high standards. But as soon as we get out of the halls you should really start to feel like you're in that city. It's very important for us in each of the cities where the shows take place that you feel the particularities [of the host city]. In Miami Beach, we try to do a lot of things outside and try to take advantage of the fact that we have a huge screen right next door at the New World Center. We try to do things on the beach. These are things that you couldn't do in Hong Kong or in Basel. Spiegler: The business model is identical. We don't reveal specific numbers. In some places the rent you pay for a convention center is quite high but your labor costs are quite low. In other places that's exactly the reverse. The shows all end up costing more or less the same, but in totally different ways. Marc Spiegler is the Global Director of Art Basel. Noah Horowitz became Americas Director in 2015. Horowitz directs the Miami Beach show. Spiegler: [Basel art fairs] are not moments where prices get set. The role they have is that all these fairs create a moment of urgency for collectors. There's work that sold before the fair because collectors want to buy it before anybody else sees it. There's work that’s sold during the fair. There’s work that’s sold two, three, four months after the fair. If you want to measure fairs’ impact on the market, you really have to look one month before and six months afterward. I've seen cases like in 2009 when everybody thought the market was really beaten down and a lot of collectors came in thinking they were going get 40 percent discounts. The galleries held the line. So within the space of an hour and a half suddenly it went from being what everyone perceived to be a buyer's market to one in which the galleries were actually able to hold their position because they have brought great quality art. Some collectors were willing to pay what something was actually worth. The other collectors realized that they were not going to be able to get things for pennies on the dollar. The Basel show is a broader and deeper barometer than the auctions for what's going on because you have so many different galleries and so many different artists from all over the world. Horowitz: Heading into Miami and the strength of the [fall art auction] season, things are looking very good. Art Basel is not just about the commercial transactions that happen inside our halls. There are exhibitions that come out of things. There are meetings that take place. There are conversations that might transpire in a transaction six months or a year after the show. Spiegler: It's much too early to say about Brazil, but I was just in Rio on the day the Brazilian bond went into junk rating. All the collectors I talked to in Rio said they were coming to Miami Beach. A lot of them have dollarized their wealth. Basically they already have moved their wealth into real estate, into bank accounts, into companies in the U.S. As far as the Chinese economy, I know from sources inside the [art] auction house that there has been a lot of Chinese bidding. The appetite doesn't seem to be much abated in China for the kind of work that we sell. Horowitz: There's been an interesting historical turn within the market recently, which is present in Miami Beach. There was a moment maybe a decade ago where everything was about the next new thing and all this incredible hype. Some of it is justified, some of it not. What we're seeing now is a look backwards to rediscovering artists that that maybe didn't get their due 20 to 30 years ago. Art Basel In Miami Gets Us Thinking: Is It Art? This guest post comes to us from Florencia Jimenez-Marcos. There is no easy way to define "art." Any attempt at simplification risks making the writer sound uninformed at best. There are countless experts and publications who have created an industry debating what is true art, though the discourse these days seems to center more on economic rather than artistic value.